There is a huge selection of toddler toys and pre-school toys that you can choose from, and your child is likely to be fascinated by all or most of them. Hundreds of new toys for children appear in the shops every year – especially at Christmas time, and they are aggressively marketed with the hope that pester power will make the newest, brightest and most expensive toddler toys an absolute must have. Toys for children are designed to be fun as well as a very important part of every child’s development. 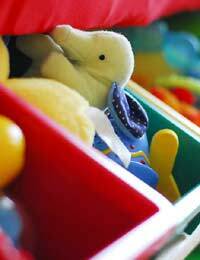 But toddler toys and pre-school toys can cause injuries – and toy safety is a big issue in the UK and worldwide. A major hazard, especially with toddler toys is the risk of choking, which can be a worry for kids aged three or younger, with their tendency to like putting everything into their mouths. Manufacturers have to follow certain guidelines, which include adding the CE Mark to all new toys to indicate that the toy has passed the safety checks expected of it before it can be sold in the EU – and there must be a label on any toy that hasn’t passed the choke test which indicates that the toy is not suitable for children under three years old. What Are The General Toy Safety Guidelines With Toddler Toys and Pre-School Toys? Make sure that any fabric toys have a label that says they are flame resistant or retardant. For hygiene reasons, all stuffed toys for children need to be washable. Look for art and craft materials that are labelled as non toxic. Look for sturdy toys that can cope with a bit of stress! Make sure that all small parts like eyes, noses, and buttons are properly attached. Make sure squeezy toys, rattles, and teethers are too big to get stuck in a toddler’s mouth or throat. Avoid toys made of flimsy plastic that might break into small pieces, leaving jagged edges. Avoid small toys like marbles, little balls, and games with pieces that are less than 4.4 centimetres in diameter as they could be a choking hazard for small children. Check age guidance instructions on all toddler toys before you buy them. Age labelling is the manufacturer's way of telling parents whether their product is safe for a child of a particular age, and shouldn’t be ignored. The ‘grumpy baby’ age warning symbol should appear on toys which the manufacturer deems to be unsuitable for children under three years old – don’t ignore this when buying toddler toys as if they show this symbol they won’t have passed the choke test and could be a risk to your child. You’ll often see the phrase ‘Under Supervision’ on toys for children of all ages, and it’s especially important with toddler toys and pre-school toys. It usually applies to toys where there’s likely to be an adult present anyway – such as water based toys, and while the toy should still be safe to use, the general rule is that any toy with this warning should not be used without adult supervision because there’s a possibility that a child could play with it in a way that could cause injury to themselves or others if it’s not used properly! @annierose. Contact the friend so she can inform the retailer about this. You should also contact the manufacturer and Trading Standards to let them know about this, so they can take steps to ensure this does not happen (with more serious consequences) to another child. A family friend gave my 12 month old a teddy. It is new, but by the time we received it the teddy had no tags or packaging. I don't know who the retailer was, but do know the manufacturer from the label. The label has the CE mark and the words "Please remove all tags and packaging before giving to a child under three years". Since all tags and packaging had already gone I thought the toy was safe. This morning I noticed the baby had something in her mouth and when I checked, it was an eye from the teddy. I pulled at the second eye on the teddy and it came off very easily. Clearly this is a choking hazard and obviously I have removed the toy from my child. What else should I or could I do about this? Can I report this? Should I contact the manufacturer?